The machine price DOES NOT include any attachments. You must add the price of the attachments (including a bucket) to the price of the machine. Our Bobcat MT85 mini track loader allows you to get your job done in tight areas with minimal ground disturbance. The MT85 can lift up to 850 pounds and has a width of 36 inches, small enough to get through tight gates in your backyard. We offer multiple attachments for this machine, including pallet forks, bucket with teeth, flat bucket, and post hole auger with the ability to drill 6", 12", or 24" diameter holes. Flatbed delivery is available, rates vary by distance. 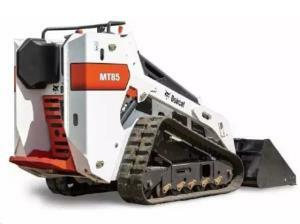 * Please call us for any questions on our mini track loader rentals in Hillsdale and Ridgewood NJ.